Bowl for Kids' Sake (BFKS) is Big Brothers Big Sisters' signature bowl-a-thon style fundraiser. BFKS is a multi-night fun-filled bowling event with prizes, games and friendly competition. 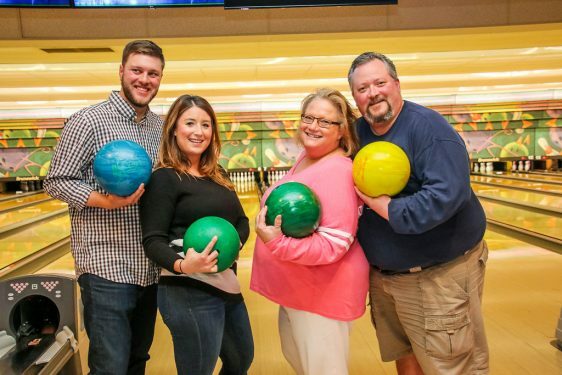 Community members and companies form bowling teams of 4-6 people and do peer-to-peer fundraising prior to their bowling night to support mentoring and make Matches happen. Participants celebrate their fundraising success with family and friends over an eventful night of bowling! Lights...Camera...Bowl! Join us for a cinematic themed celebration at our 2019 BFKS fundraiser! Show up to your bowling night dressed as your favorite movie character for a chance to win the Best Costume Prize! Click below to register for BFKS 2019 and to start raising BIG! Event dates, times and details can be found by clicking below. It takes many hands to put on this multi-day event. We could always use more help at the event with checking in bowlers and teams, handing out t-shirts, delivering pizza and drinks to the lanes, handing out prizes and photography assistance. If you are willing and able to volunteer at one of the event dates, please click below to sign-up. For further questions, please contact our Special Events Coordinator, Bethany Ordaz at bordaz@bbbsmadison.org or 608-661-5437 ext.111.